A car bomb has exploded near a Hezbollah base in eastern Lebanon. There were conflicting reports about the number of casualties and whether a suicide bomber had blown up the vehicle in the remote part of the Bekaa Valley. The National News Agency said it was a suicide bombing, but Hezbollah's TV station and the army claimed otherwise. The incident occurred about 20km (13 miles) from the border with Syria, where the Shia Islamist movement has been supporting government forces. The conflict has fuelled sectarian violence in Lebanon, including a series of car bombings in Beirut and Tripoli that have killed dozens of people. Last month, two suicide bombers blew themselves up outside the Iranian embassy, killing 23 people. An al-Qaeda-affiliated group said it carried out the attack because of Iran and Hezbollah's backing of Syrian President Bashar al-Assad's efforts to crush a Sunni-dominated revolt. 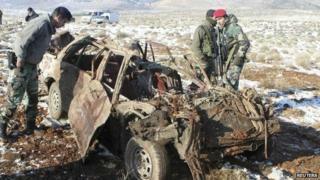 A senior Hezbollah commander was also assassinated on 4 December. Television pictures of the scene of Tuesday's blast showed several damaged vehicles, including the charred, twisted wreckage of an overturned car. A reporter for Hezbollah's al-Manar TV said the car that blew up had been filled with about 50kg (110lbs) of explosives and that the bomber's target appeared to have been a Hezbollah base 2km (1.2 miles) away. The NNA initially reported that the vehicle had been "intercepted" at a Hezbollah checkpoint and exploded after members fired on it. Later, it said it was a suicide bombing that caused multiple casualties. Security sources told Reuters news agency that Hezbollah members had begun to follow the explosives-filled car shortly after spotting it shortly after 03:00 (01:00 GMT). It then exploded, damaging the two Hezbollah vehicles, killing one person and injuring two others, they added.